Tuesday, November 8, 2011, three entered center stage at the Penn & Teller Theater in the Rio Hotel in Las Vegas. One emerged with the grand prize – Pius Heinz. My personal favorite, 2011 WSOP Player of the Year Ben Lamb came in third – AND – it happened so fast, frankly, my head was still spinning 2/3 way through the 119-hand heads-up play between Heinz and Staszko. On the first hand, Lamb (SB) went All In after a re-raise from Staszko (BB). Heinz had folded the button. You can imagine the noise in the Penn & Teller Theater. It was unbelieving frenzy. If Lamb won the hand, Staszko would be out and we would be down to heads up. If Staszko were to win the hand, he’d double up and Lamb’s stack would be decimated – and we’d be very close to heads up. Lamb had KJo. Staszko had a pair 7s. Lamb was unable to improve and Staszko took the hand. Lamb had 12.7M left in his stack. On the fourth hand, holding Q6o, Lamb went all in for the rest of chips and Staszko snap-called with a pair of Js. Lamb was out in third place winning a little over $4M. Heinz and Staszko went on to play another 119 hands over approx. 6 hours. From what I’ve read, it wasn’t all “the Heinz show” which some might have expect due to his past performance and his chip stack. Reports are that Heinz did a good job of chipping away at Staszko’s stack, then Staszko would win a monster, and win all his chips back. In fact, at 11:30 PM PST the stacks were within 15M of where they had been 5 hours before. Is this the start of a new tradition? The November Three? I don’t get it. Is it more exciting because you don’t know who the final two are? Is the third player there to make sure that final table play is delayed until after 12:00 am so that the winner will not be known until (Wednesday) November 9th? 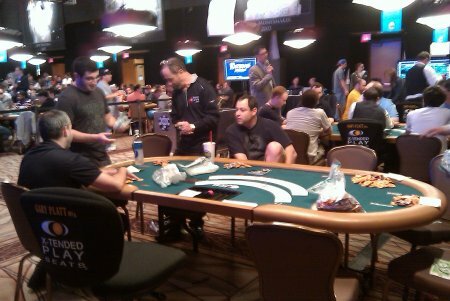 Starting stacks for this evening’s 2011 WSOP final Final Table. I presume that the 2011 WSOP final Final Table will be streamed on WatchESPN. 2011 WSOP Final Table play (Second table) No live link yet. You can watch the replays of Sunday night’s activities when they started with 9 players…2011’s November Nine. 2 Days 'til the 2011 WSOP Main Event Final Table! The 2011 WSOP Main Event Final Table takes place at the start of next week – November 6-8, 2011. Unlike previous years, when they played down to 2 starting on Saturday and played heads-up play on Monday, this year, the November Nine will start play on Sunday and play heads up on Tuesday. Sunday, November 6, ESPN2 will carry every single poker hand beginning at 12:30 PM PT. Tuesday, November, 8, ESPN will carry the finale beginning at 6:00 PM PT. OMG! 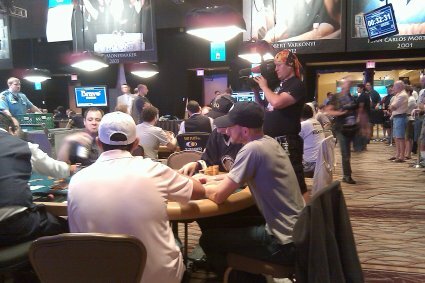 Today is the last day of the Summer session of the 2011 WSOP Main Event. The day started with 22. While waiting for the 1/2 hour streaming delay… 4 busted out, so, when streaming started, the players had redrawn and were seated at two full 9-person tables with 18 remaining. Today they’ll play down to 9… and the 2011 November Nine will be crowned! Anton Makievskyi is ahead of the field with 29K chips. He is followed by Eoghan O’Dea (21.5K), Konstantinos Mamaliadis (16.5K), Ben Lamb (15.7K), Andrey Pateychuk (13.3K). Lars Bonding (US), Chris Moore (US), Gionno Demers (US), and Aleksandr Mozhnyakov (RU) were the four who started the day and busted in the first 30 minutes. Oldest in field is 51, Sam Barnhart of Little Rock, AR. Youngest in field is 21, Andrey Pateychuk of Moscow, Russia. While strolling through the RIO today getting a feel for the WSOP, taking in the sounds and trying to wrap my brain around the endless sea of poker players in front of me with no horizon in sight – I stumbled upon the area reserved for Day 4 action of the $50K Poker Players Championship. When I arrived, there were four empty tables with bags of chips. I had missed the updates the night before, so, decided to wait around to see if any of the elite poker players showed up. Ha! Not only did the elite poker players show up, but, each table was loaded with incredible talent. The table in front of me was so packed with power…I chuckled to myself over the serendipity of me ending up at that spot at that time. A handout told me that these (table to the right) were the players who were going to be playing four feet in front of me. I would actually be able to hear the table banter. And let the play begin! Right away there was some action. Phil Galfond, short stacked with 47K, went All In from the Big Blind on the first hand and was busted by chip leader Josh Arieh. I stood on the rail for the whole first level. No incredible hands, but there were some of the “old” Phil antics with him reacting upon being three-bet and four-bet and being shown bluffs. Looked to me like every other player at the table was doing his best to get Phil on tilt. He shook his hands, whined, stood up a couple of times. Thankfully, there were no ugly *Northern European* smackdowns as in the past. All in all, Phil was well behaved. Of note is the fact that Phil’s wife Katherine is sitting just off the table to the left directly in across from him. Notable players at other tables: Gus Hansen, Jeff Lisandro, David Oppenheim, Robert Mizrachi, Minh Ly, Shaun Deeb, Brain Rast, Scott Sevier. @PokerNews is reporting a bad beat story that really is a BAAAAHHHHHHD Beat. It happened in the $1,000 Seniors No-Limit Hold’em Championship (6/18/11 at around 9PM EST). Vikie Seley took a bad beat from an empty seat of an unknown player! The floor declared ….the empty seat’s stack was dead and Seley was out of the competition. It was an unfortunate “timing” of events for Seley. Read more at Pokernews.com about Vickie Seley’s Bad Beat in the Seniors $1K No Limit Hold’em Championship. that the final table is in progress and being streamed on wsop.com. It was down to three… but still going when I joined the action. Sean LeFort’s two black 10s just got busted by Allen Bari’s 2 red kings… First card of flop was a King. Turn was a 10.. giving Sean trip tens that just can’t beat trip Kings. I don’t see any WSOP events listed on the Upcoming tab at ESPN3.com for next week. 2011 WSOP Kicks off in 2.5 hours in Las Vegas! The 2011 World Series of Poker (WSOP), the 42nd Annual WSOP, taking place at the Rio Hotel in Las Vegas, starts in a few short hours. The first event, the $500 No Limit Hold’em tournament for Casino Employees starts at Noon Vegas time. This afternoon at 5PM Vegas time, WSOP Event #2, $25,000 Heads-Up Championship starts. The Heads-Up tournament is capped at 256 poker players and expected to be completed within 4 days. 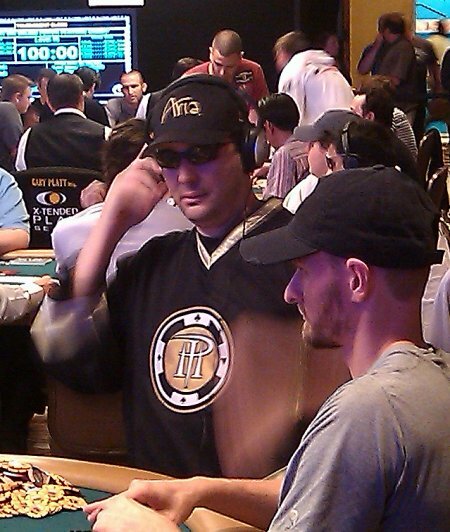 REMATCH #1: 2003 WSOP Main Event: Chris Moneymaker vs. Sammy Farha – Best 2-out-of-3 format. REMATCH #2: 1989 WSOP Main Event: Johnny Chan vs. Phil Hellmuth – One match. Derrrr… I did a lousy job planning vacation time this year. Woulda like to have railed the heads-up and Thursday’s re-matches. Anyways, I see that the third re-match is by Fan Choice.. hummm… wonder where fans are voting…I’ll chase that down and report back. Of course, all the poker action during the Summer leads up to Event #58, the Main Event, which starts July 7th and concludes with the November Nine; the $10,000 No-Limit Hold’Em Championship! Structure sheets, registrations and more about -> the 2011 WSOP Schedule.